Rory Gallagher is back in action! He returns to Britain this winter for a major tour highlighted by a concert at the Royal Albert Hall, London. And, as a prelude to the shows, Gallagher will be releasing a new album later this month. The LP, called " Against the Grain" is his first for the Chrysalis label. The concerts will be the first time since December last year, when his tour included two of the final shows to be staged at the Rainbow rock theater in London. This year's tour starts at the Apollo, Glasgow , on December 13. followed by concerts at Birmingham Town Hall (15), Manchester Free Trade Hall (16), Newcastle City Hall ( 18, Sheffield City Hall (19) and the Royal Albert Hall (23). The London concert is another step in the Royal Albert Hall's new liberal policy. Rock concert were once banned there following shows by the Who, Chuck Berry and Mott the Hoople. But now the Hall's authorities are relenting on their ban, allowing concerts by Steeleye Span and this week, Camel. Out on the Western Plain, and At the Bottom." ( keyboards) and Gerry McAvoy ( bass guitar). Gallagher is currently on tour in Canada and , later this month, he embarks on a long series of concerts in America before coming to Britain. “Against The Grain” (Chrysalis 1098). Rory Gallagher (guitars), Lou Martin (keyboards), Gerry McAvoy (bass), Rod de’Ath (drums and percussion). Produced by Rory Gallagher at Wessex Studios, London. ON STAGE, speed and guts is the name of Rory Gallagher's name, but his studio work has remained feeble in comparison. “Against The Grain,” the first studio album since “Tattoo,” sees him turn over a new leaf, creating the same frightening, unnerving atmosphere that has made his live shows so eventful. Rory himself has admitted that he was less than satisfied with his studio history, and although live albums have been released, they, too, have lacked the excitement generated on stage. At last, however, Rory has found a successful recording formula. Perhaps one explanation for his newfound excellence in the studio is his band. The Gallagher band — Lou Martin, Gerry McAvoy and Rod deAth — has grown with experience, and Rory places more faith in them, bouncing rifts of the astounding rhythm section sharing searing runs with pianist Martin. It brings a new dimension to Gallagher's music. Another could be that Gallagher himself has spent the past two years free from studio work, assessing what has been missing from studio albums. Whatever it was, Rory has found it. In the past, tracks like “ Hands Up” lacked the same impact on record they had on stage. That is not the case with "Against The Grain.” Furthermore, rock is the main course on the Gallagher menu. 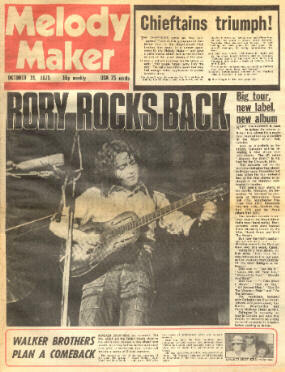 It would have been natural for the album to contain a fairly large percentage of simple acoustic blues numbers, due to Rory’s appearances at a number of such festivals during the year, but it hasn't happened . Rory has decided not to mute his personal tastes but to give his fans what they want —hard driving rock. Eight of the tracks are fast. Gallagher has done a little more than give the fans what they want. He has produced eight rockers that rank among the best he has written in his many years as an artist, The opening tracks, “ Let Me In “ and "Cross Me Off Your List" have punch unparalleled on any other Gallagher studio album. In fact, the only time I can recall Rory summoning so much strength is on the first “ Taste “ album. ‘ Let Me In “ is Gallagher at his most direct, with a hard-hitting rift that lands bang between the eyes. “Cross Me Off Your List,” laid-back feel and all, is in a lower key, the emphasis on the feel, but it's soon converted into a rocker. Once again it's reminiscent of early Taste material with Gallagher singing note for note with the guitar. “ Ain’t Too Good ‘ is the obligatory slow song that seems to be a characteristic of all his albums. Its gentle guitar/piano intro sets a melancholy mood. The track is given an added sharpness with periodic guitar jabs. “Souped-Up Ford” is, appropriately, speedy and powerful, with Rory’s busy slide guitar work building well over the pounding bass and drum beat. One of the outstanding cuts, though, is the closer on side one, “Bought And Sold.” Rory is at his strongest vocally on a track that boogie's along nicely. If he were the type to do singles, this would he the one to let loose on, with its wailing guitar solos and foot stomping heat. Or flipping the album, it becomes increasingly clear to me that Gallagher has indeed surpassed himself. It appears he has an endless list of riffs . There's another new one on -- I Take What I Want ‘and an even stronger one on “ Lost At Sea.’ On the latter track, Gallagher beautifully mixes the fast and the slow rhythms with a medium-paced verse, quickly changing direction via a swirling guitar passage. And, of course, there's the blues on Out On The Western Plain.” His fine acoustic playing will continue to win him many friends. The track is sympathetically arranged, with the vocals mixed slightly above the guitar. Slide guitar enters later in the song. The album doesn't end on the same dramatic note on which it opened. Instead, a thoughtful country-like ballad, “ At The Bottom,” has Rory sounding unusually mellow. I prefer the hard-rocking Rory portrayed on the rest of the album, and I think his fans will too. magnificent work. They've helped to make " Against the Grain" Rory Gallagher's finest moment on record. H.D.